Eniva Minerals for Life® Thyroid Care Multi Minerals is a liquid dietary supplement for thyroid support, providing a specialized mineral blend designed to promote the proper health of the human body, especially the thyroid gland. * It contains the Cell-Ready® minerals IODINE, ZINC, SELENIUM, COPPER and MANGANESE in a proprietary nutrient delivery system developed for our natural thyroid supplements. Support healthy thyroid function with our liquid vitamins and minerals. Thyroid: Tiny Gland, Yet Critical for Health. Many people might not know just how important the thyroid gland actually is... Did you know that this tiny gland produces hormones that influence almost every organ, tissue and cell in your body? This vital gland, located on either side of the middle of your neck, is very important for producing hormones that influence nearly every organ, every tissue and every cell in your body. Your thyroid is critical to your overall health, and without proper function, puts your entire body at risk. In the event of radiation contamination, if you have a properly functioning thyroid, it will take less time for an additional highly concentrated form of potassium iodide to fully saturate your thyroid, thus preventing the absorption of harmful radioactive iodine. It would be similar to watering your lawn. If you sprinkle it on a regular basis, the grass has a good, moist base. It doesn't take much at the next watering to saturate it. If you let your lawn turn dry and brown, it will take many waterings and a very long time before it returns to a moist, healthy state; and even worse, may not have the ability to absorb water when it needs the moisture most. The bottom line is: the healthier your thyroid, the better your chances of survival in an attack or accident. Nuclear activity produces many radioactive substances that can harm people. One such substance - radioactive iodine - poses a particular threat because the human thyroid gland rapidly absorbs and uses iodine as a fundamental building block to maintain life. Report to the President's Council on Environmental Quality: "Exposure can be a concern more than 100 miles downwind from an accident... thyroid damage could affect more people than any other radiation effect." The Bulletin of Atomic Scientists: "Following a catastrophic accident, hundreds of thousands of thyroid nodules cases could occur as well as tens of thousands of delayed cancer deaths." Even food sources can become contaminated, as evidenced in the Chernobyl incident where radioactive iodine fell on fields. Cows naturally ate the grass, and children then drank milk from the cows, resulting in additional harm to those children. Exposure to radioactive iodine is devastating. According to statistics put forth by the World Health Organization, over 50,000 expected cases of cancer amongst young people will have been attributed to the Chernobyl disaster. And of great concern, is the fact that children are especially susceptible to radioactive iodine absorption resulting in increased rates of cancer, organ failure, birth defects, recurrent infections, impaired kidney function, infertility, fatigue, depression, digestive problems, weight irregularities, stunted growth, and even death. Since the thyroid is programmed to take in iodine from the first available source, and it isn't able to distinguish good iodine from bad iodine, radioactive iodine will be absorbed and damage will begin unless preventive steps have been taken. The good news is that the thyroid gland can only store so much iodine. Taking a highly concentrated form of potassium iodide before or immediately after exposure will "flood," or fill up, your thyroid gland with safe, stable iodine to a point where there is virtually no more room for radioactive iodine - the harmful iodine will be ignored and harmlessly excreted. Just how effective can incorporating specially-designed iodine products be in the event of nuclear exposure? World Health Organization: "Stable iodine administered before or promptly after intake of radioactive iodine can block or reduce the accumulation of radioactive iodine in the thyroid and significantly help to reduce damage from exposure." U.S. Food and Drug Administration: "The effectiveness of KI as a specific blocker of thyroid radioiodine uptake is well established (Il'in LA, et al., 1972) as are the doses necessary for blocking uptake. FDA maintains that potassium iodide is a safe and effective means by which to prevent radioactive iodine uptake by the thyroid gland, and thereby obviate the risk of thyroid cancer in the event of radiation emergency." "As time is of the essence in optimal prophylaxis with potassium iodide, timely administration to the public is a critical consideration in planning the emergency response to a radiation accident." "FDA also emphasizes that emergency response plans and any systems for ensuring availability of Potassium Iodide to the public should recognize the critical importance of such (distribution) in advance of exposure to radioiodine." American Thyroid Association: "KI floods the thyroid with safe iodine and prevents it from absorbing the radioactive form. Babies, children up to 18, and pregnant women are the most important to receive KI after exposure." "It is essential that, one way or another, enough KI be available to protect the public, especially children, in the event of a nuclear accident or act of radiological terrorism." Nuclear Regulatory Commission: "...only about 50% of the uptake of radioactive iodine is blocked if the iodine administration is delayed six hours after exposure, and little effect can be achieved if delayed more than 12 hours." (States should) "...consider potassium iodide as a supplement to evacuation and sheltering." In December 2001, the NRC offered potassium iodide to states so that anyone living within 10 miles of a nuclear power plant would have enough supply to get out of town or wait for the radiation danger to pass." In addition, Cresson H. Kearny, author of Nuclear War Survival Skills, an original edition published by Oak Ridge National Laboratory, a Facility of the US Dept of Energy, states on page 111: "A form of the elements potassium and iodine, taken orally even in very small quantities before radioactive iodine is swallowed or inhaled, prevents about 99% of the damage to the thyroid gland that would otherwise result." The US Food & Drug Administration has stated: "The effectiveness of Potassium Iodide as a specific blocker of radioactive iodine is well established. FDA maintains that potassium iodide is a safe and effective means by which to prevent radioactive iodine uptake by the thyroid gland, and thereby obviate the risk of thyroid cancer in the event of radiation emergency." And across the world, this scientific, documented information is recognized and endorsed. The World Health Organization in its 1999 Guidelines for Nuclear Accidents states: "Stable iodine administered before or promptly after intake of radioactive iodine can block or reduce the accumulation of radioactive iodine in the thyroid and significantly help to reduce damage from exposure." Statements like these have led nations across the world including, Great Britain, Switzerland, Sweden, Norway, France, Austria, the Czech Republic, Slovakia, Poland, and even Japan and Canada to endorse aggressive distribution of potassium iodide to its citizens. The grave news is administering potassium iodide must be done in a very immediate fashion in the event of nuclear exposure. The Nuclear Regulatory Commission stated in July of 1998, "Potassium iodide, if taken in time, blocks the thyroid gland's uptake of radioactive iodine and thus could help prevent thyroid cancers and other diseases caused by exposure in a nuclear accident." Unfortunately, being "too late" can mean damaged, even lost, lives. As stated in the Nuclear Regulatory Commission's Report No. 65: "...only about 50% of the uptake of radioactive iodine is blocked if the iodine administration is delayed six hours after exposure, and little effect can be achieved if delayed more than 12 hours." Remember, time is of the essence. Unless the government provides each household with adequate stock to have on hand before a nuclear radiation emergency, critical life-saving time would be needlessly wasted trying to distribute it. Potassium Iodide (KI) is a naturally occurring salt, made up of the minerals potassium and iodine. It is generally delivered in a granular form or a neutral aqueous solution. In the event of a nuclear attack or accident, radioactive iodine would be released in the air, and eventually deposited in the water and on the land. It would be primarily inhaled and absorbed into an inhabitant's thyroid gland, causing negative health effects and long-term bodily harm. Children are particularly susceptible. 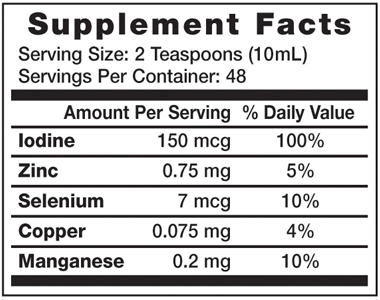 Certain forms of iodine help one's thyroid function properly. The thyroid is designed to absorb and store iodine, but it can only hold so much, and will readily absorb any type of iodine, regardless of whether it is radioactive or not. Because of this, Potassium Iodide, which is NOT harmful to the thyroid gland, works by "filling up" the gland so it cannot absorb any harmful radioactive iodine. There are two ways that KI should be taken. Step One is a daily basis amount, and Step Two is a radiation emergency amount. Is It Safe To Take KI? A low dose of maintenance Potassium Iodide is safe to take on a regular basis to achieve 100% of the US RDA of Iodine. Excessive amounts, above the US RDA, as high doses can be detrimental when taken over long periods of time. Pregnant women and newborns should check with their doctor. People who are allergic to iodine should not take KI, and those who have rare disorders should consult their doctor first. Low dose, maintenance KI should be taken every day. High dose KI should be taken only at the instruction of public health or government emergency officials. Remember, taking high dose KI is not a substitute for evacuation. Citizens must leave the area immediately if they are instructed to do so. Maintaining and supporting a healthy thyroid on a daily basis is extremely important. Take a bio-available thyroid care formula that includes potassium iodide as a dietary supplement each day to get 100% of the US RDA of Iodine. With this step, you are promoting the healthy, normal functioning of the thyroid gland and conditioning it for efficient uptake of iodine in an emergency situation. Please remember, when it comes to nuclear readiness, there is no second chance. In an age when terrorism and nuclear mishaps are a distinct possibility, you need to be proactive. You need to be informed. You need to have resources on hand, in your homes and businesses. This information is meant to communicate the possibility of radiation contamination and its effect on a healthy thyroid. Proper nutritional supplementation may aid in supporting a healthy thyroid, and an oral prophylaxis approved by the FDA will assist in protecting against and/or minimizing radiation contamination. This information is not to be considered medical advice or replace the advice of a medical professional or an emergency government official. It is not intended to treat, diagnose, or cure any disease. People who are allergic to iodine should not take potassium iodide products. The purer the water the more efficiently minerals are activated into their electrically charged ionic state. Eniva uses OHM® water (multi-step purified water) in a unique proprietary process at Eniva's government-inspected manufacturing facility, yielding an advanced aqueous form of ions (Solutomic) in clear solution for fast absorption, unlike tablets or capsules which must first dissolve in the digestive system before being absorbed. Ingredients: Purified water, natural flavors, inulin (from chicory root), malic acid, stevia leaf extract, zinc (from zinc sulfate), manganese (from manganous chloride), copper (from copper sulfate), iodine (from potassium iodide), selenium (from sodium selenate). Directions: Adults: 2 Teaspons daily (10mL). Caution: Do not take this product if you have been diagnosed with liver failure. If you have a HYPER-Thyroid condition, this product is not recommended without first consulting your health care professional. Do not consume if tamper resistant seal is broken or missing. Do not consume if allergic to components found within product. As with all dietary supplements, consult your doctor before use. If taking prescriptions, have ongoing medical condition, pregnant, nursing or under age 18, consult doctor before use. Isolated minerals or nutrients are best taken as part of a well balanced diet and broad supplement program. KEEP CAP TIGHTLY CLOSED. KEEP OUT OF REACH OF CHILDREN.